All Aboard the Scenic Rail! Arkansas reveals her inner beauty from the Arkansas and Missouri Railroad’s route through the bluffs and valleys of the Boston Mountains. Impeccably restored and polished, the passenger train is a ride back in time and a journey forward as the wonders of Ozark wildlife and 1920s opulence merge during this two-hour excursion. 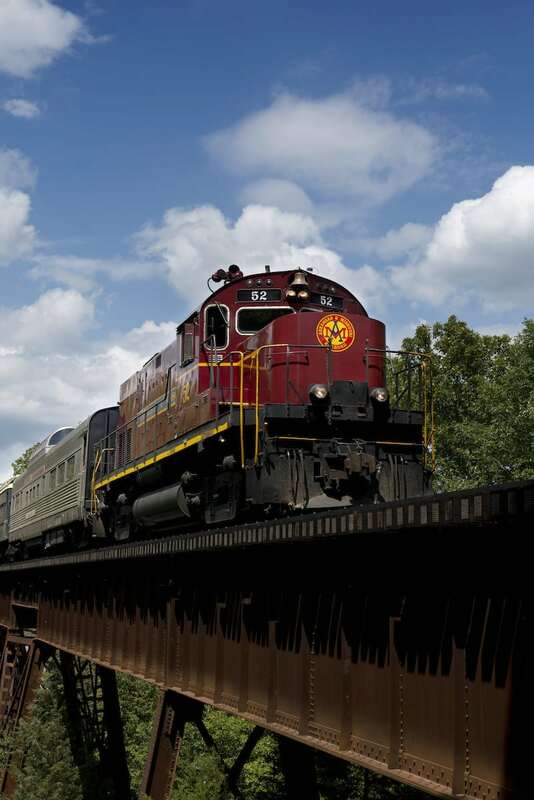 Begin your afternoon adventure at The Old Frisco Depot, a Van Buren landmark for over a century and now home to the Van Buren Visitors Center and boarding point for the Arkansas Missouri Railroad’s excursion train. Settle into the plush grandeur of the comfortable passenger cars and hold your breath as the tracks take you over crystal clear streams, through a quarter mile tunnel and traverse a series of trestles overlooking the rugged and spectacular forestland. Laugh and wonder with the conductors, who will share their tales of lore and knowledge of this beautiful and bountiful part of the world. For the latest schedules, fares and to purchase tickets, visit amtrainrides.com or call 800-687-8600, or 479-725-4017.